Essentially, there is no financial benefits being a Stay-At-Home-Mom (known as SAHM hereafter), instead it is an economically senseless or irrational to be a SAHM. Then, why are there so many SAHM? In fact, I am one too for now. So, what is the rationale for being irrational? In accordance to the Singapore Department of Statistics, there were more than 50% of women below 45 years old holding a tertiary qualification in Singapore in 2012. 1.9% or 18.5 thousands of economically active women between 25 to 44 years old was unemployed in June 2013. I have scouted through the websites of Ministry of Manpower and Singapore Department of Statistics, there is no data on SAHM. Of course, we are employed by the household not the work force, so we belong to the ‘economically active yet unemployed’ category. Question is, why would many highly educated women chose to be classified as unemployed to be a SAHM which yields no financial benefit? In fact, all the SAHM who I personally know belongs to the “more than 50%” category. Some hold an MBA too! I have tried searching for a remuneration guide for a SAHM, results: almost zero success rate. 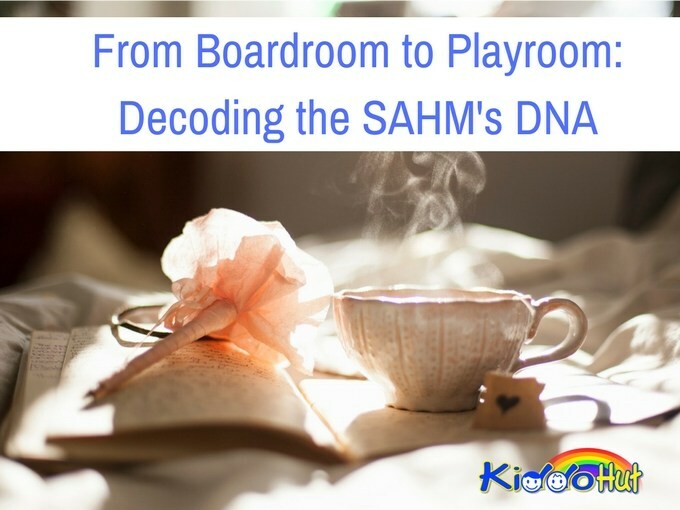 There is an article that tries to break down the various roles of a SAHM or SAHD, and assigns an hourly rate to each of the roles which then adds up to a salary figure of a SAHM/D. I think this is interesting but I tend to feel that a SAHM/D may assume various roles and important roles as well, take for example, a CEO of a household, the hourly rate should not equate to a corporate CEO. No doubt, a household’s CEO is important and it is directly affecting the lives of our future generation and leaders, and probably the little ones may be a CEO of the future Fortune 100 company, we still cannot equate the role of running a household with the running of a corporate. A big corporate CEO handles millions or billions dollars business, earns his/her experiences through his/her years in the corporate/businesses and importantly, a CEO is required to have excellent people skill in handling difficult adults especially. So, how much am I worth in dollars and cents as a SAHM now? I don’t know but I am sure I definitely worth something (… to my family). So, why is it so difficult to put a monetary value to this role? Yet, there are people who are willing to give up their pay check job to take up such role. All jobs have a defined job description regardless whether your boss does keep within the job scope or not when assigning job tasks to you. SAHM is a job, a job that serves her household. Nonetheless, a SAHM doesn’t have a defined job description. I tried to do up a job scope for myself as a SAHM, I realized I am performing approximately 99 tasks every day. And, these 99 tasks could vary day to day. Okay, I am exaggerating here, there are no almost-hundred tasks every day. What I am trying to convey here is, a SAHM does have tons of tasks to perform each day she wakes up and approximately 30% is routine and balance is non-routine. The percentage varies by household, but the non-routine, undefined, unstructured and beyond control tasks are definitely there which usually are the causes for the efficiency and productivity to drop in that particular day. I used to think that being a SAHM is easy, what’s so difficult over keeping your house clean and looking after your own children. It is not difficult, but it is tedious, time consuming, highly unstructured and highly unpredictable. While you are doing some washing, your tots may be screaming away or fighting over a toy or keeping really quiet. Hold on, keeping really quiet may not necessarily be an obedient indicator, they could be munching away happily on something inedible like a battery. Or, your baby may be crawling with a soiled diaper that is leaking out poo while you are kneading your bread dough. Or, you may have a high need (code red) of using a toilet, and your tots are experiencing this separation anxiety clinging to you like a koala bear clinging to the tree, what would you do? I knew people who took up a certain job or set up own business for the sake of challenging own-self but I don’t think any SAHM decides on this role to challenge ourselves. I would like to impress here that a SAHM is not just a mom. In fact, a mom role is a subset of a SAHM. I see a SAHM is more than just a mom, we are a teacher, nursery caregiver, nurse, driver, cleaner, chef, finance, at times we may have to put on the work suit of a plumber, electrician, carpenter or, engineer. So, once again why would anyone want to take up such role? Personally, I feel that it has something to do with the DNA of a SAHM. I have done a mini survey among friends and sibling who are currently a SAHM, on the reasons they are taking up this role. Reasons I got range from “I don’t like to work” to “I want to take care of my own kids” to “My children need me” to “I am taking a career break” to “I want to do something else”. To a certain extent, we can apply the Maslow’s hierarchy of needs to ascertain the motivations behind a SAHM. 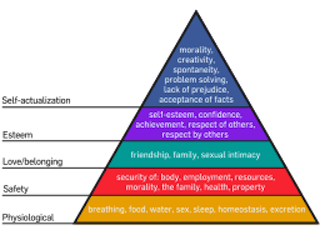 Maslow’s hierarchy of needs is a theory in psychology proposed by Abraham Maslow, and first appearing in his 1943 paper “A Theory of Human Motivation” in Psychological Review. Maslow described the pattern which human motivations generally move through, in this order: Physiological, Safety, Belongingness and Love, Esteem, Self-Actualization and Self-Transcendence. To a SAHM, her motivation is to meet her family members’ basic and safety needs. In particular her kids, she will make sure her children are well-fed and safe from dangers. The love from her children and appreciation from her husband keep her going despite the tiredness from performing all the household chores and facing the screaming kids the whole day. That nicely meets her needs of love and belonging. The longer a SAHM is in the position, the more experienced she is in handling her household matters which give her the confidence to handle any situation, be it a non-routine or emergency. That gives her a sense of achievement and self respect. Most of the SAHM stay home because of her children. What can be more rewarding than be the first person to witness her kids achieving all the growth milestones, and excel in their school work. In fact, a SAHM’s self-actualisation needs are mainly derived from her children’s achievements. That’s the time when SAHM feels her worth in forgoing the monthly pay check to stay at home. Seemingly, a SAHM has no life of her own and her life is evolved just around her family. This is pretty true to someone who works at home 24/7. Hence, it is imperative that a SAHM gets to engage in a hobby or two to maintain her sanity. Or, perhaps the DNA may never be fully decoded. The role is so broad and varies greatly from household to household that it is impossible to define any SAHM as “typical”. And, the role continues to evolve. The role of a SAHM today is fairly different from what it was 30 years ago during our mom’s era because of the changes in education system, intelligence level of our kids, our kids’ exposure to more stimulated environment as well as changes in technology like immersion of tablets, smart phone. Still, there must be some generic critical success factors of a SAHM. Ergo, it is a highly challenging role but apparently also deeply satisfying – I believe to all SAHM, if we have our time all over again, we would still choose to be a SAHM. A choice between monetary and time with our children is not easy in this world of “everything needs monies”. However, once a decision is made, the choice seems pretty obvious. Being a today’s SAHM, I will still go back to workforce in future. But, there is never a slightest regret in taking a break from my career to stay home with my kids. The rewards are immeasurable and that answers the question on the monetary value of a SAHM. We don’t need one. It is akin to the feeling of “I am poor but I feel rich”. A CFO role is also a highly satisfying job and at times I would miss the fun of being in the corporate world. Howbeit, for now I am taking the opportunity to develop a different skills sets on my personal front.